Are you challenged by the lack of space to store your things? As much as you want to showcase and organize everything, you may be limited by the storage space that you have especially if you live in a small apartment. Your place will eventually become cluttered, leaving you feeling cramped. What you need is a way to store your things while making your place more stylish and cozy. And what's more heart-warming than rustic vibes. Save yourself from the horrors of clutter. Have more room for storage and get organized with PETER'S GOODS 2-Tier Rustic Floating Wall Shelves. 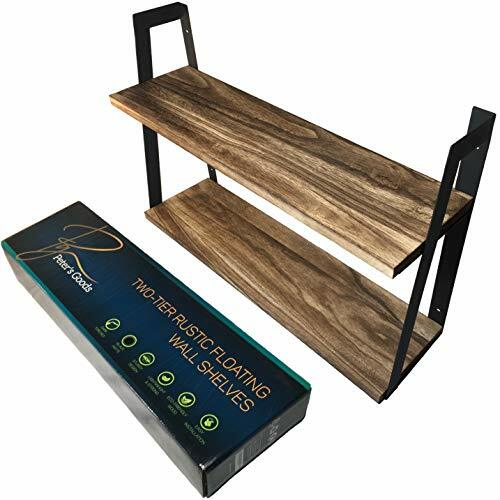 Whether it is for your home or office, our 2-tiered floating shelf is definitely a great addition. Not only will it give your place a rustic twist but it will also provide you with more storage room. It complements any décor or room you have. It is also perfect for displaying your souvenirs, books, photographs, trophies, and many more. Our floating shelf features a vibrant and deeper wood color unlike others in the market today. The steel frame of the unit is coated with Black Matte Powder which makes it look as good as new longer while making it more resistant to chipping, scratches, abrasion, corrosion and harsh chemicals. ✅ Store towels, detergents, kitchen spices, utensils, food jars, indoor plants, tools and more! Add a rustic feel to your home and increase your storage space with the Peter's Goods 2 Tier Rustic Wall Shelves! Add it to your cart NOW!  MAXIMIZE & ORGANIZE - Get extra storage even with limited space. Our 2-Tier Floating bookshelves give you more room with more height, depth, and width. It even allows a 10-inch book to stand upright.  DISPLAY SOME HEAVYWEIGHT - Strong and durable, they are made with eco friendly and incredibly light Paulownia wood. The latter is knot-free, warp and bug resistant and can hold anything up to 50 pounds!  ADD SOME PERSONALITY - Get a rustic farmhouse feel with a modern industrial twist. Our shelves' dark rich wood grain gives you a sense of a country home while the black matte steel framing adds a modern edge.  CERTIFIED CUSTOMER SATISFACTION - We are confident that you'll love our product. If you face any issues, we'd be glad to assist you. We also offer a 1-year limited warranty. Order now risk free!